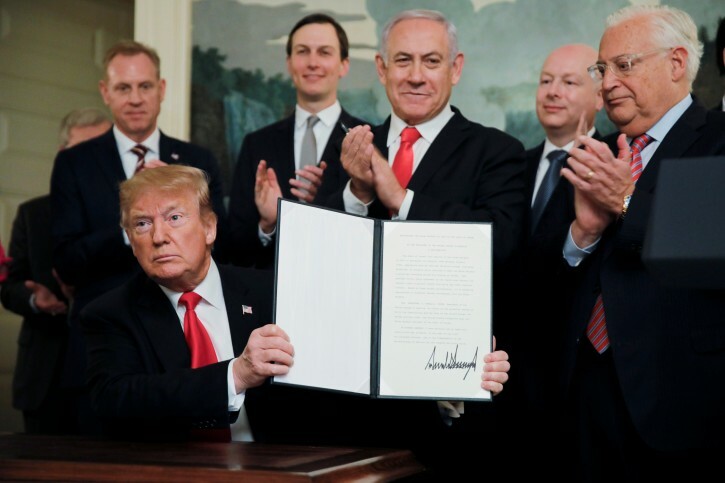 Washington - President Donald Trump signed a proclamation on Monday recognizing Israel’s sovereignty over the Golan Heights, reversing more than a half-century of U.S. policy. Mazel Tov! It only took 52 years; as Golda Meir told Anwar Sadat, when he visited Israel in 1977 "What took you so long"? gilgul of King Cyrus! MAGA!!!! Obama was a better speaker, a better dresser, behaved more dignified but hated Israel and did everything possible to make our life hard. Trump is a big mouthed speaker, lacks the dignity of a president, runs the WH like it is his personal business, but he is a good friend to Israel and we should be very grateful that he is in the WH and not Obama or Clinton.